I haven't the time to write individual posts on these subjects, but I do have plenty of new features for the CC1110 that are worth sharing. Rather than explain how they were written in too much detail, I invite you to read the source code, which is mostly Python and C shellcode. In order to follow along with these examples, you will need to have SmartRF Studio installed to /opt/smatrf7. While this requirement will go away in a few weeks, the GoodFET client temporarily needs SmartRF Studio for machine documentation about the CC1110. You can find more details on SmartRF requirements in the goodfet.cc client page. (1) Packet sniffing, and other neighborly scripts. GoodFETCC now has packet sniffing support for the SimpliciTI protocol used by the Chronos watch. Not only that, but it implements the protocol well enough to act as an access point for the watch, collecting accelerometer data and deciphering it for the host. Run an access point with 'goodfet.cc simpliciti [band]'. (This command will likely change names soon, as it is a rather ugly hack which only supports the Chronos accelerometer feature.) The optional parameter should be us, eu, or lf for the American, European, and Low Frequency versions of the watch. Not only protocols intended for the GoodFET, but also others which are coincidentally compatible, are supported. 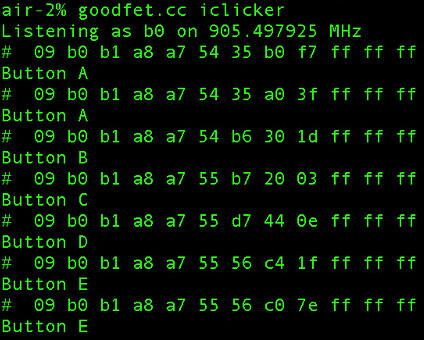 Thanks to some register settings contributed by Mike Ossman, you can sniff and decipher i<clicker traffic with 'goodfet.cc iclicker'. 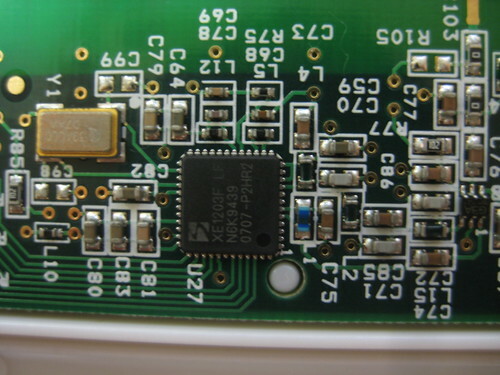 The i<clicker uses a Xemics XE1203F (PDF) radio chip, shown below. The XE1203F is nearly as configurable as the CC11xx parts, except that it is limited to 2FSK encoding. 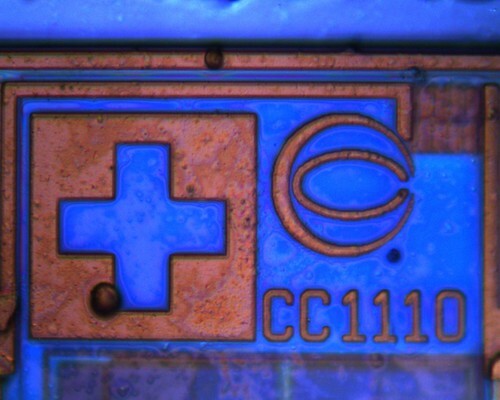 Previously, this protocol could be sniffed with the GR-Clicker project and a USRP, but the highly-versatile CC1110 chip allows this to be done with neither a software defined radio nor a chip identical to that used by the transmitter. Care to jam another transmitter? 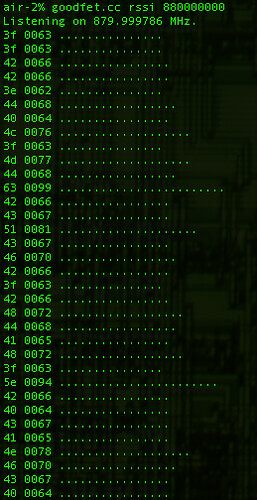 Just like with the Next Hope Badge's GoodFET mode, it takes a single command to hold a carrier wave. 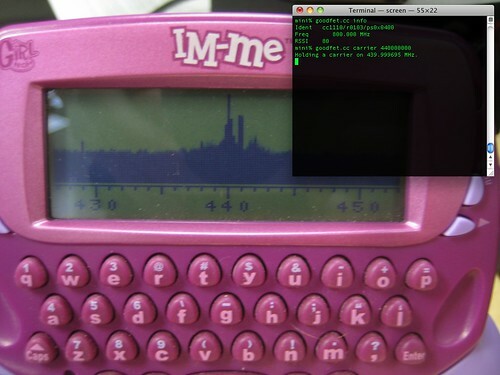 (2) Shellcode, now for quiche-eaters! At the risk of appearing to facilitate quiche-eating, I'd like to quickly explain the new shellcode interface for placing code fragments on a Chipcon 8051 target, such as the CC1110. The Chipcon radios have certain functions which are timing sensitive, chief among these being the rewriting of flash memory and the use of the digital radio core. If flash memory is not pulsed with the correct timing, mis-writes will occur. If the radio is read too slowly, bytes will be missed and a buffer underflow will ruin the transaction. Similarly, a transmission might fail if the single-byte transmission buffer isn't refilled quickly enough. 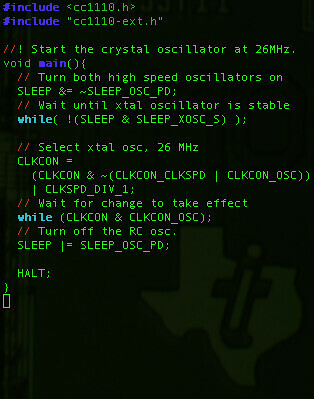 I've also had trouble, for reasons that I can poorly explain, configuring the crystal oscillator through the debugging interface without shellcode. As I described in my CC2430 Debugging Notes, the recommended method of flashing memory is to write a small block of code into XDATA RAM which does the actual write, then to branch to this code, waiting for a HALT (0xA5) opcode to return control to the debugger. This routine is provided in SWRA124 as machine code with assembly comments, beginning with the fragment shown below. While this is fine and dandy for code that works, it's a bit infuriating to debug code in machine language. (Is that opcode supposed to be 0xA5 or 0xA6? Is the length of this instruction correct? Similar frustration abounds.) To correct for this, the GoodFET project now has a trunk/shellcode directory in addition to trunk/firmware and trunk/client. Shellcode is compiled for target microcontrollers, in this case just the CC1110 by SDCC, the Small Device C Compiler. For inputs to these functions, and also for their return values, I find it more convenient to declare arrays at known locations than to read the symbol files to find them. The syntax for placing an array in XDATA memory at 0xFE00 is 'char __xdata at 0xfe00 packet;'. You can find examples of this in txpacket.c and rxpacket.c in the GoodFET repository. (3) Care to join the fun? There are a number of features remaining to be implemented in shellcode. Among them in a completed port of Ossmann's $15 Spectrum Analyzer, which I began in CC1110 Instrumentation in Python and you can find in the contrib/ directory of the GoodFET repository. By dropping the GUI interface and replacing it with timing delays, full spectrum scans can be made in decent time without requiring that anything in flash memory be changed. Another handy tool would be an OOK sniffer that over-samples, using the infinite-packet-length trick described in the CC1110 datasheet to fill ram with a recording. Triggering on RSSI allows the beginning of the packet to be reliably timed, with oversampling allowing for correction on all later bits. I've begun to implement this as 'goodfet.cc sniffook [freq]', but an enterprising neighbor should be able to start sniffing garage door remotes in short order. A Morse-code library in combination with an external amplifier would also be neighborly for the licensed amateur bands. The ability of the microcontroller to quickly return and channel hop might be able to account for, among other things, the Doppler shift experienced in EME moon-bounce experiments, without losing backward compatibility with 19th century radio technology. As a prize, I offer one ale apiece for GoodFET patches implementing these features. I've just picked up a couple CC430 based chronos watch and intend to use them to brew-up a vehicle security system. This post is very informative/insightful towards that project. BTW, isn't SmartRF Studio a windows-only install... but judging from your screenshot I may not have to cram windows back onto my Mac... ? These days, I install it to a VM then moved it to /opt/smartrf7 on my workstation. In the past, I've had success using it through Wine. Another handy tool would be an OOK sniffer that over-samples, using the infinite-packet-length trick described in the CC1110 datasheet to fill ram with a recording. Did you know that you can create short urls with Shortest and receive dollars from every visit to your short urls.